Order Confirmation: your order will be confirmed within 5 working days upon receipt by our Sales Representative with indication of an estimated dispatch date. Proforma Invoice: to be settled within 10 days (*). Please note, the production of your order will start upon Proforma Invoice is settled. Order Confirmation: your order will be confirmed within 5 working days upon receipt of prepayment. (*)The bank details of BCM SENSOR for bank transfer or Card Processing Form for card payment can be requested when placing the order and will be provided to you by our Sales Representatives together with Proforma Invoice. BCM Price terms: Net ex-works Antwerp/Belgium (to be delivered from Antwerp warehouse), transport cost and VAT are not included. 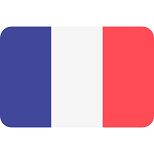 VAT policy: For any customer located outside Belgium, there is no VAT to be charged on our invoice. Transport cost: If you want the shipment to be collected by your carrier from BCM SENSOR, you can provide to us your account number with your carrier. Otherwise the shipment can be delivered via TNT or any door-to-door service (UPS, DHL, FedEx). The transport cost will be determined by the carrier, depends on the total weight of the shipment. Administration cost: If the amount of your order is less than 200.00 €, an extra cost of 100.00 € will be charged as administration cost. Payment methods: Via bank transfer or by credit card. In case the payment is arranged by credit card 3% extra cost will be added to the amount as indicated in our invoice, i.e. the total amount to be paid by credit card is equal to 103% of the amount invoiced. 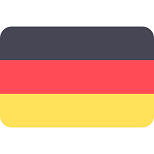 We accept payment in either Euro or US dollar. Strain Gauges Q1: How to Bond BCM SENSOR Strain Gauges? To bond our strain gauges, please refer to the document of Bonding Procedure of BCM Strain Gauges. You may also find this document in the documentation on each product page of strain gauges and adhesives. Strain Gauges Q2: How to Make Use of BCM SENSOR Karma Strain Gauges? BCM SENSOR Karma strain gauge is a kind of metal foil strain gauge with the foil from Karma alloy. The main components of Karma alloy are copper, nickel, aluminum, and iron. This combination results in resistivity of 1.24~1.42 x 103Ω•m which is about three times higher than Constantan alloy, and has gauge factor of 1.86~1.98. Comparing with the Constantan strain gauges, the Karma strain gauges have the following advantages and disadvantages. Capable of realizing E.M.C. (effective modulus compensation). It is more difficult to solder leads or wires onto solder pads of the Karma gauges. The strain gauge with SP finishing is easier to be bonded. Therefore, if there is no difficulty in your application to solder leads onto the Karma gauges, the SP finishing is a good option. As mentioned above, it is difficult to solder leads on solder pads of the Karma gauges. If you have no such experience, it is better to take use of the gauge with SD finishing although SD finishing makes the whole gauge less flexible and with less smooth than SP finishing. Before soldering the leads, you may use a sandpaper with 800 mesh to remove the oxide layer on the solder pads, and clean the solder pads with Ethanol. To avoid the solder pads being oxidized again, it is better to solder the leads immediately after above-mentioned procedure of cleaning solder pads. The suggested temperature set for the soldering iron is 300°C. Then solder the leads with the 2.5% flux and the solder, SD-705 or Sn60Pb40. The above-mentioned engineering suggestions are based on BCM SENSOR experience. For more information, please contact us through Contact Form by choosing Technical Support. Strain Gauges Q3: What is Self-Temperature Compensated (STC) Strain Gauges? – application notes of using STC gauges. For detailed engineering advice on utilizing the STC gauges, one can contact BCM SENSOR. Strain Gauges Q4: What is Creep Error? Creep error is not often discussed although it is a common phenomenon everywhere, which also exists in sensors. When one is dealing with the precision sensor of accuracy higher than 0.05%fs, one cannot avoid this parameter. In sensor applications, the creep error (in short, called creep) can be observed as a continuous time drift of the output signal of a sensor when it is loaded with a given load. This time drift characterizes either continuously increasing (positive creep, curve I) or continuously decreasing (negative creep, curve II) in the output signal of the sensor over a certain time. The output signal finally approaches to a stable level which is corresponding to the given load, as shown in Fig. 1 below by the saturation part of the curve. The maximum magnitude of this time drift in sensor output signals is called the creep error of sensors. Another creep error is so-called Zero Return which can be observed as a continuous time drift of the sensor output signal when the given load is removed from the sensor. 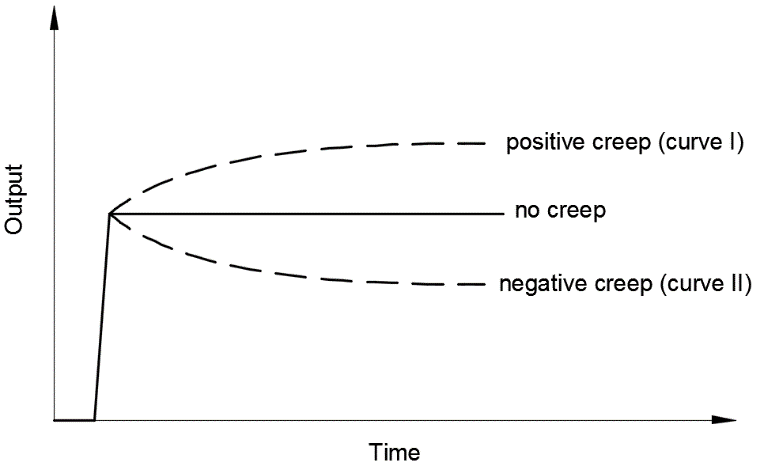 Either a positive or negative creep can be observed as a Zero Return depending on the sensor’s characteristics, as shown in Fig. 2. Both creep phenomena, creep-error and zero-return, as mentioned above, are induced by the same root cause: namely an imperfect transfer or non-prompt transfer of the resultant strain from the sensor body to the bonded strain gauges upon the loading or unloading of the given load on the sensor. Therefore, if the creep-error is corrected, the zero-return will be removed simultaneously. 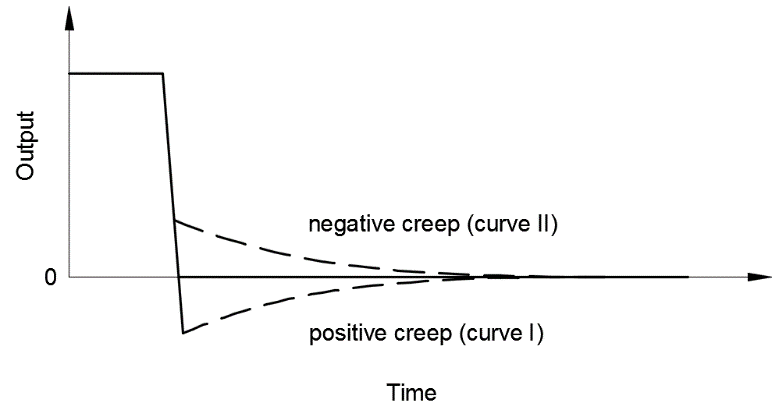 It must be pointed out that, the creep phenomenon in force-related sensors can last for 30 minutes and it is mostly observed within the first 5 minutes from the moment of force loading or unloading. Therefore, if the observed change in sensor output signal lasts longer than 30 minutes, either continually increasing or decreasing, the change may not be caused by the creep phenomenon but caused by something else. For detailed engineering advice about the creep error, one can contact BCM SENSOR. Strain Gauges Q5: How to Correct Creep? – how to select suitable creep code for metal foil strain gauges from BCM SENSOR. For detailed engineering advice on selecting a right creep code for the creep compensated strain gauges, one can contact BCM SENSOR. Website: How to Use "Compare Products"? The "Compare Product" function is aimed to bring you convenience to compare the different products which are interesting to you. Once you click the "Compare Products" button on the webpage of the specific product, the key specifications of this product will be listed in a compare table on the "Compare Products" page. You can review this compare table by clicking the "Compare Products" on the header. General: What is the difference Between Transducers and Transmitters in BCM SENSOR Products? The main difference is in the output signal. The output signal of the transducers is same as sensors'. For the piezoresistive sensors and transducers, the output signal is in millivolt. The output signal of the transmitters is a conditioned and amplified signal, e.g., 4~20mA, 0~5Vdc, and I2C. BCM SENSOR specializes in design, development, and manufacturing of customized sensors which covers all of our products, from pressure sensors to strain gauges. If you have special requirements for your measurement or application, please contact us through our Contact Form, and select Technical Support as Recipient, so our R&D engineers can support you. With over 20-year experience of strain gauges and load cells manufacturing, BCM SENSOR also provides the strain gauges bonding service for our precision strain gauges. By this service, BCM SENSOR has been supporting our customers all over the world to produce their OEM sensors, and there has been a lot of customized sensors produced in this way with BCM SENSOR precision strain gauges through the high-standard bonding process. Please contact us if you have your designed sensor-body to be gauged at BCM SENSOR with our strain gauges. BCM SENSOR has an extensive experience in sensor die bonding. We provide the sensor die bonding service with our sensor dies to help our customers optimize the production procedure. Contact us if you want BCM SENSOR to bond our sensor dies onto your sensor headers. If you have difficulty to wire bonding the sensor dies to your electronic circuit, BCM SENSOR can provide the service to do the wire bonding for you. Additionally, we can provide the IC packaging of our sensor dies, so that the sensor dies can be integrated together with its SSC (sensor signal conditioning circuit) as one IC. Please contact us for more information, through our Contact Form and select Technical Support as Recipient.